January 10, 2018 | 12:13 am – THE Philippine Stock Exchange (PSE) found 60 securities to be compliant with the principles of Islamic finance as of the end December 2017, it said in a quarterly review posted on Tuesday. 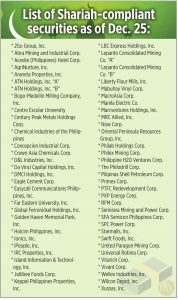 The review period ending December saw three firms enter the list against the quarter prior, where the PSE tallied a total of 61 Shariah-compliant firms. 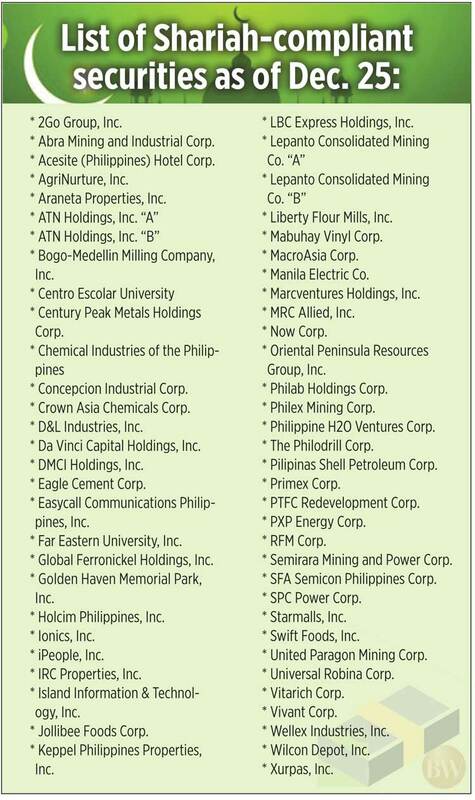 This includes Ionics, Inc., Keppel Philippines Properties, Inc., and Philab Holdings Corp.
Four firms, meanwhile, were dropped from the list, namely Apex Mining Company, Inc., Asian Terminals, Inc., Philippine Estates Corp., and Philippine Realty and Holdings Corp. The PSE tapped IdealRatings, Inc. to conduct the screening of the listed firms, as per the Accounting and Auditing Organization for Islamic Finance Institutions standards for Shariah compliance.